The sensitivity of teeth can be caused because of using a hard toothbrush and using a hard grip while brushing aggressively. Knowing the need of brushing in the morning when you are half asleep is hard, so take help of an electric toothbrush for sensitive teeth to keep brushing precise. This list includes smart and best electric toothbrushes for sensitive teeth. 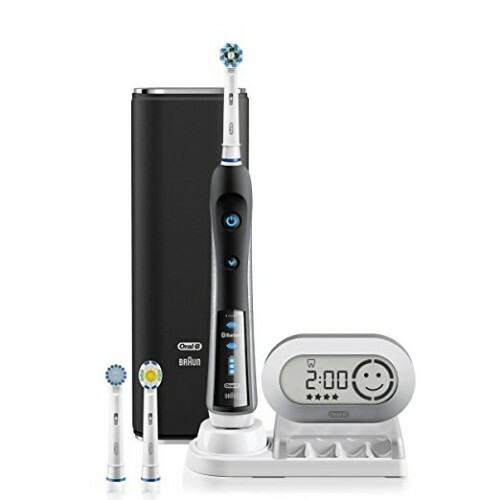 The newly designed Oral-B Black 7000 smart series with Bluetooth is the world’s first of its kind with Bluetooth connectivity. 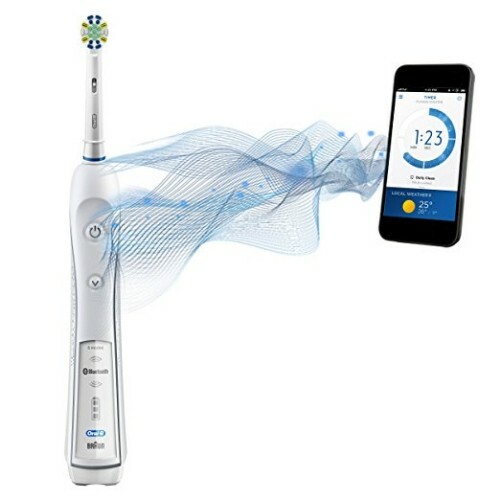 This feature of the toothbrush allows you to get the real time feedback by connecting it through Bluetooth to your smartphone. This toothbrush has a pressure sensor indicates you, if you brush too hard. This prevent harmful over-brushing. The cross-action brush head surrounds each tooth with bristles angled at 16 degrees, to break up and remove up to 100% more plaque than a regular toothbrush. The properties such as Sensitive Clean, Precision Clean, Focus Action of this toothbrush makes it the perfect choice for the people who are not regular to their dental checkups. The Oral-B app on your smartphone will let you know the condition of your teeth from time to time. It has a pressure sensor and a tongue cleaner. The charger doesn’t support 240V. So if you travel outside the US – good luck with that. It has a Bluetooth connectivity. Long lasting battery, lasts for up to 10 days with regular use. An electric toothbrush with Bluetooth communication between brush and smartphone provides real-time feedback on brushing habits. 3D cleaning action oscillates, rotates, and pulsates to break up plaque and remove more plaque along the gum line than a regular manual toothbrush. It has been provided with 5 modes: Daily Clean, Gum Care, Sensitive, Whitening, and Deep Clean. You can switch to any mode according to your convenience, mood, and requirements. Download the Oral-B App on your smartphone and use Bluetooth technology to get real-time feedback. You should opt Oral-B Pro 5000 Smart Series power rechargeable electric toothbrush because it is the safest electric toothbrush present worldwide. If you are searching for a good electric toothbrush, then you can always trust Oral-B Pro 5000. Visible pressure sensor and Bluetooth technology. This product seems to be designed for a single user only. Operates at the lower speed to clean teeth and gums properly. Gentle polishing for white teeth in 2 weeks. Activates massage mode to gently stimulate gums. 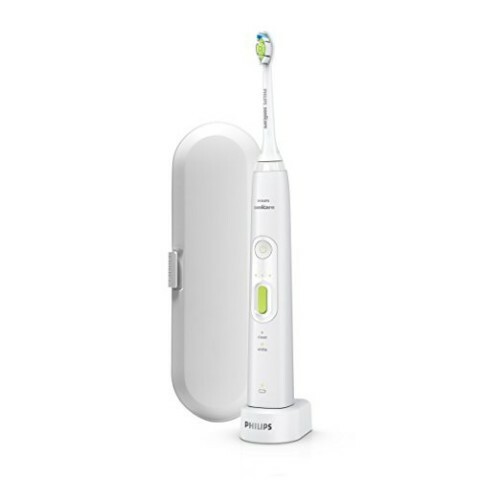 The Philips Sonicare Healthy White plus offers dynamic brushing action to provide gentle, effective cleaning that reaches between teeth and along the gum line with up to 31,000 brush strokes per minute. The Philips Sonicare healthy white plus rechargeable toothbrush is proven to remove up to 100% more stains for whiter teeth in only 1 week. It removes up to 7x more plaque than a manual toothbrush and even it has a 2-minute timer to ensure dental professional recommended brushing time. This toothbrush improves gum health in two weeks and gives white teeth in as little as one week. It has six customizable settings for comfortable and thorough cleaning. So, it would be a good choice if you are searching for an electric toothbrush for sensitive teeth. A smart timer and a quad pacer. It vibrates a bit strongly. Easy USB charging and comes with travel case. It has an illuminated display. The Philips Sonicare Toothbrush is a rechargeable electric toothbrush which removes 6x more plaque than a manual toothbrush. It gives you 31,000 brush strokes per minute. Easy-start feature of Philips Sonicare will make you feel very comfortable with it. Its smart timer will inform you after two minutes of healthy brushing, as recommended by the dentists. It has an ergonomic handle with an intrinsic grip which makes holding brush easy and comfortable. 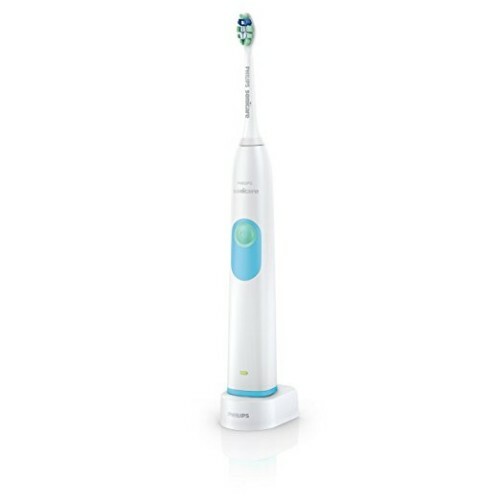 Philips Sonicare will let you know when you have to charge it by using its 2 color charge indicator. 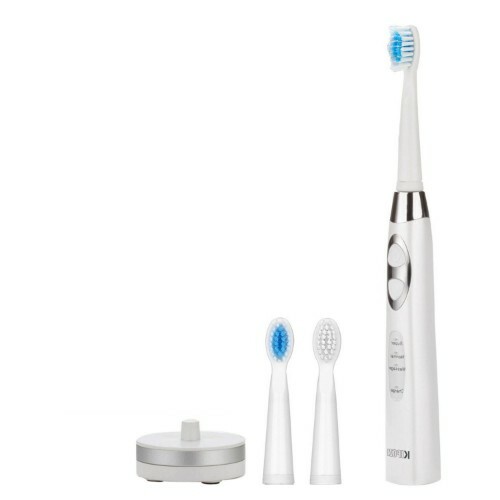 The kit has one Philips Sonicare 2 Series rechargeable toothbrush, one pro results plaque control brush head, and, one charger. In conclusion, This product will make you realize that even brushing teeth can be very joyful. So without even thinking twice, you can go for it. The brush head is durable and lasts longer than 3 months. So there is no headache of changing the toothbrush. The included brush head is pretty smallfor the people who has bigger jaw than average. Philips is a very trustable brand. Comes with a coupon for $5 off replacement brush heads, which will be very economical. This toothbrush is recommended by many dental hygienists for sensitive teeth. Dr. Jim Ellis’s electric toothbrush gives you the most thorough cleaning with 40,000 oscillations per minute and specially angled bristles. It removes 5X more plaque than a manual toothbrush.It gives you the most perfect clean and white teeth. The toothbrush has 3-speed variations – pulsate, oscillate and massage to rival a professional dental cleaning and is perfect for kids. It has 2 minutes automatic timer and 30-second quadrant timer to ensure that you give appropriate attention to your whole mouth. The long-lasting battery makes it ideal for travel. Electric toothbrush by Dr. Jim Ellis for sensitive teeth is a safe choice. It has 2 bonus brush heads which give you 2 months of brushing actions. So it could be a perfect choice for you. 2 bonus brush heads give you 18 months of brushing action. The toothbrush would not stay in the handle after a few weeks as the metal clip inside the handle becomes loose. 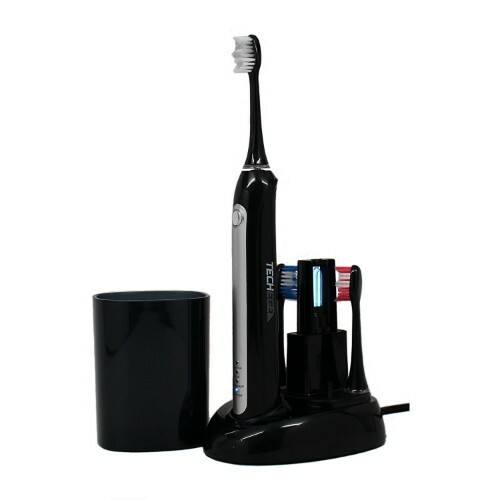 Dr. Ellis’ Sonic Toothbrush is the superior and cost-effective, rechargeable toothbrush. 2-Year Guarantee ensures your satisfaction. Very safe as it is directly a dentist’s product. Sonic electric toothbrush by KIPOZI has a patent sonic technology with up to 35000 micro-brushes per minute for a deep and neatly clean. So, now no more yellowing or sensitivity problems of teeth, just be ready to have perfect white and healthy teeth. The sonic electric toothbrush has three modes to satisfy your brushing experience – Super for everyday use, Normal for sensitive teeth and gums and massage to stimulate gums and provide a perfect oral health. You can use any mode according to your convenience and comfort. This package includes one electric toothbrush, two replacement heads, one inductive charger base, and one USB cable. So, you don’t need to go somewhere to purchase anything for this toothbrush, the kit includes everything.It is very beneficial for you to bring this product and include it in your daily routine. Each Sonic toothbrush comes with 2 replacement heads providing 9 months high-quality brushing. Triple pressure sensor helps to protect your gums for over brushing. KIPOZI provides a very friendly service and gives a one year warranty of its product. Dr. Patty Martin developed iBrush Electric toothbrush is to solve all the existing problems related sensitive teeth. She kept sensitivity patients in mind and made it, so you won’t face any difficulty while brushing because it is made with the perspective to solve all the difficulties regarding sensitivity. With up to 48,000 strokes per minute, iBrush electric toothbrush removes plaque in such a manner that you will be surprised by the cleanliness. With 3 different operating modes; Normal.soft and massage, this powerful toothbrush can adapt to any users level of comfort. We recommend normal mode for sensitive teeth. 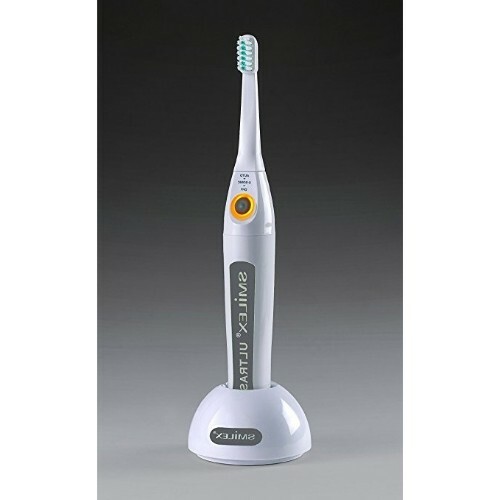 A dentist designed iBrush is the best choice when looking for a quality electric toothbrush at a price anyone can afford. Its sleek design helps in removing more plaque as compared to your normal manual toothbrush which makes you feel as if you’ve just walked out of a dental clinic. The Quad Sense technology emits a pulse from the handle every 30 seconds, which lets you know that you have finished brushing in one area now move to another. iBrush electric toothbrush is provided with a UV Sanitizer that kills 99% of harmful microbes. iBrush works for more than 6 weeks on one charge. The Sterline Electric Toothbrush is the perfect toothbrush if you have sensitive teeth. Its authentic technology makes it perfect for the people who are looking for such delicate toothbrushes which help them to get rid of their sensitiveness. 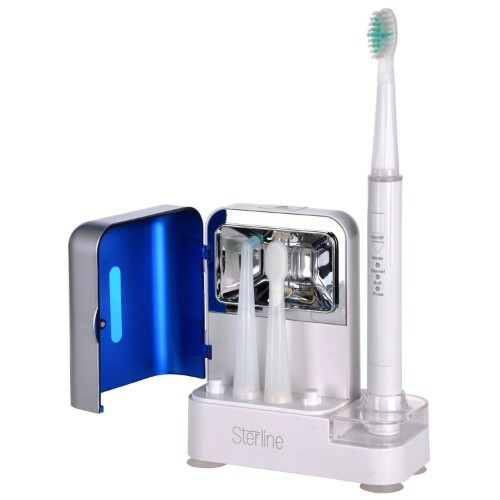 Sterline Electric Toothbrush has a UV light sterilizer, three brushing modes, two built in automatic-timer and interval timer, a 30-second timer that allows you to clean all four quadrants of your mouth evenly and a powerful cleaning technology with 31,000 brush strokes per minute. With multiple brushing modes and brush heads, this electric toothbrush makes sure that it cleans up to 99% of germs and bacteria. So you can easily go for Sterline Sonic Pulse Electric Toothbrush for a new and a good experience. Slim handle and light weight. Extremely bright LED indicators in the handle that cannot be turned off. For 30 second cycles with a brief pause between them. 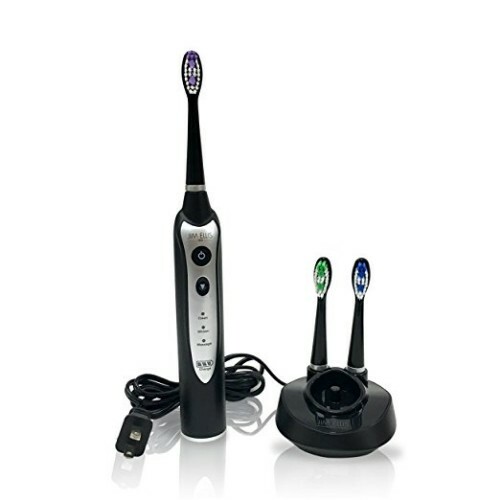 The Smilex AU-300E ultrasonic electric toothbrush is the newest and the most advanced ultrasonic toothbrush available.The new and latest technology of this brush makes it much better than the other toothbrushes available in the market.Because of its amazing features, it will be very easy for you to select it above all the other brushes. The Smilex AU-300E Electric Toothbrush reduces 97% plaque on first brushing.It has a dual frequency technology that provides 18,000 Sonic bristle vibrations per minute.So it gives you ultra clean teeth with perfect white shine. You can rely on Smilex Dual Frequency Ultrasonic Toothbrush to treat your periodontal disease.It helps you to manage your dental problems very well even without a dentist’s concern.So without any confusion, you can purchase it. It comes with two brush heads, soft and medium bristle brushes so you can select the one that you prefer. This electric brush is small. In 30 days it reduces bleeding by 60% and Gingivitis by 28%. Smilex also comes with a warranty of one year. Pursonic S520 Toothbrush gives 40,000 sonic strokes per minute to effectively remove plaque without irritating your gums. It is helpful because it easily reaches those areas where other toothbrushes hardly reach. Pursonic Electric Toothbrush has three modes, power/clean, soft/gentle and massage modes.You can switch on to any mode according to your convenience. It is so user-friendly that you will never have any issue in handling it. The Pursonic provides you with the most trustworthy toothbrushes worldwide. With top features, this brand has secured a good position in several hearts. 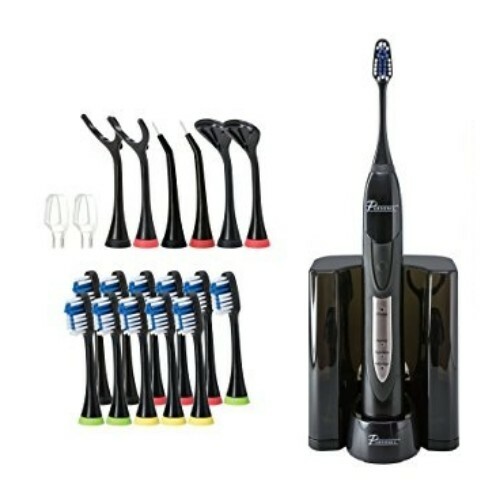 So, if you are looking for a good electric toothbrush then you can always opt this brand. Comes with a 2-minute timer and a 30-second vibrate alert in order to remind you to brush a different quadrant of your mouth. It is not a very durable electric toothbrush. Also, comes with 4 color coated brush heads and is great to share this product with up to 4 different users of the family. Provided with a 1-year warranty.